Commission member Lee Bass with his wife Donna and two granddaughters Judah and Malala. Scioto Court of Common Pleas Judge Mark E. Kuhn and Judge Howard H. Harcha, III announced that Lee B. Bass has been appointed to the Scioto County Veterans Service Commission. Bass’ appointment will be from January 1, 2019 through December 31, 2023. Bass represents the Military Order of the Purple Heart, of which he is a member. Bass had previously served in the United States Army. Bass had previously served on the Commission, serving an unexpired term ending December 2018. The primary duties of the Veteran’s Service Commission is to provide direct and indirect financial assistance to veterans and their dependents, who have met with an unexpected hardship. Members of the Veteran’s Service Commission are drawn from posts or chapters of congressionally chartered veterans’ organizations located within the County. The current organizations represented on the Commission are from the American Legion, Veterans of Foreign Wars, Disabled American Veterans, AMVETS and the Military Order of the Purple Heart. 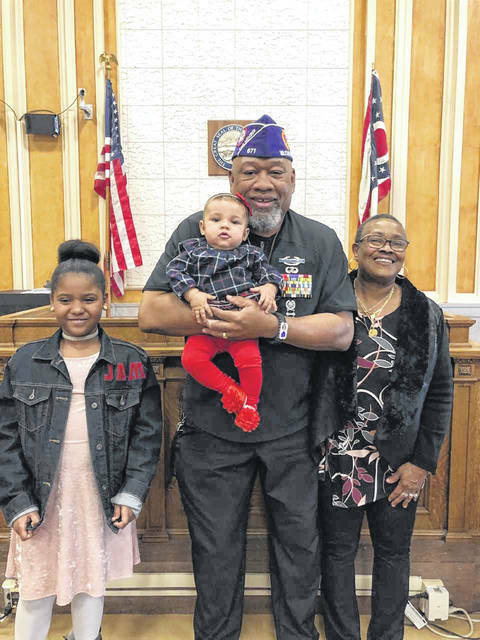 https://www.portsmouth-dailytimes.com/wp-content/uploads/sites/28/2019/01/web1_BASS_ne2019116133559154.jpgCommission member Lee Bass with his wife Donna and two granddaughters Judah and Malala.